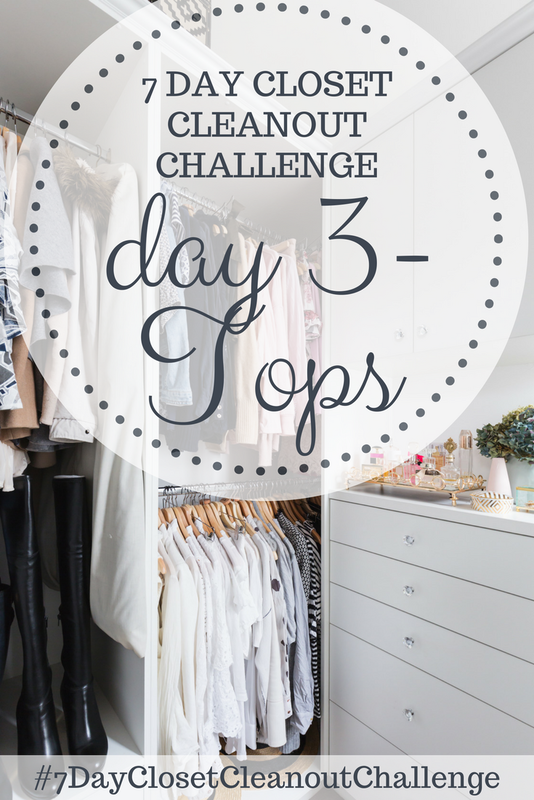 Welcome to Day 3 of the 7 Day Closet Cleanout Challenge! If you missed the post that explains what the challenge is and how to get entered into the giveaway that's taking place at the end of the week, go back and read it HERE. Today's task is one of the biggest ones we'll have this week. We'll be sorting through all of our tops today. This includes our tank tops, tees, long sleeved tops, sweaters ... everything. Remember, each task is meant to take around 30 minutes, so if you're getting overwhelmed or have a large number of items to go through, you can always break this step into multiple days. For the SELL pile, you can either sell these in a garage sale, on Craigslist, to a local consignment store, or to my personal favorite, ThredUp. I choose ThredUp because it's so easy. You just request a free clean out bag from their website, fill it with your name brand clothing that's in good condition, and mail it back (free of charge). They will pay you for the clothes they keep and decide to resell. I like to hang all of my tops, excluding sweaters, which I fold and store on shelves. I hang everything in my closet on these hangers because in addition to being very slim and space saving, having all of your hangers match makes everything look so much more organized and uniform! I personally like to separate my tops into 4 different "sections" in my closet: tank tops, short sleeves, long sleeves, and sweaters. I've recently added a new category - cardigans - and decided to hang them because my sweater section is getting too full, and, let's be real, cardigans can be hard to fold! Once I have my tops hung in their respective categories, I color coordinate them. I know color coordinating definitely isn't for everyone, but in addition to looking oh-so-organized, it's easier to find things and put outfits together! I even color coordinate my husband's shirts (so they don't ruin the general aesthetic of our shared closet, of course) but he may not appreciate it quite as much as I do. I fold my sweaters (and all of my folded clothing) per the Kon Mari Method. You can watch a video demonstrating here. SIDE NOTE - Marie Kondo, the creator of this method, is a little crazy, which you know if you've read her book. The book does have some good tips on folding and storing items, and it's also quite entertaining to hear her talk about how our clothes have feelings (yep, I'm serious). Once I have all of my sweaters folded, I stack them on shelves so that they can all be seen at a glance. I don't like putting things in drawers if I can help it because you can't see everything in the drawer at a glance, and inevitably, things get "lost" at the bottom. And that's it! Are you feeling more organized just reading this? !